Following any surgery, it’s important to make sure that your musculoskeletal system is brought back to a proper functioning level. This includes your bones, muscles, cartilage, tendons, ligaments, and joints. Orthopedic rehabilitation provides the necessary care and treatment through physical therapy that allows you to return to your level of functionality before surgery, and in some cases, puts you at a greater level of functionality than before. At Elmhurst Extended Care Center, we understand that each and every person’s needs are uniquely theirs. Likewise, each person’s care should be unique to their own needs and situation. For any patient receiving physical therapy at our facility, we sit down with you and create an individualized care plan that encompasses your needs following surgery, your goals during your stay, and your vision for what it will be like when you return home. Our dedicated and knowledgeable staff put together a plan with you that is centered around the care that you need, not anyone else. If you have family members joining you for this process, we also work closely with them to ensure that your needs are being met because at EECC, your family is our family. Staying somewhere other than your own home during rehabilitation can be a difficult transition for anyone. Our facility is designed to feel as much like home as possible. We offer many private rooms that include their own private restroom, bed, sitting area, and TV. Our courtyard is a wonderful gathering place that brings that feeling of the comforts of home outdoors, and our aviary is a unique touch that allows our facility to not feel like a facility at all, rather just an extension of your home. We hear repeatedly from both long and short term residents and their family members how much Elmhurst Extended Care Center doesn’t have the sterile feel of most nursing care facilities. It’s our goal to make you as comfortable as possible, no matter how long or short your stay. Post-surgical, orthopedic rehabilitation through EECC doesn’t stop the moment you walk out the door. We know in order for you to be successful following therapy, you need to be able to return to functioning well in your own home environment. Our staff works closely with you and your loved ones to ensure that your return home is an easy transition and that your needs are being met. We are always here to help if any needs arise after your return home. 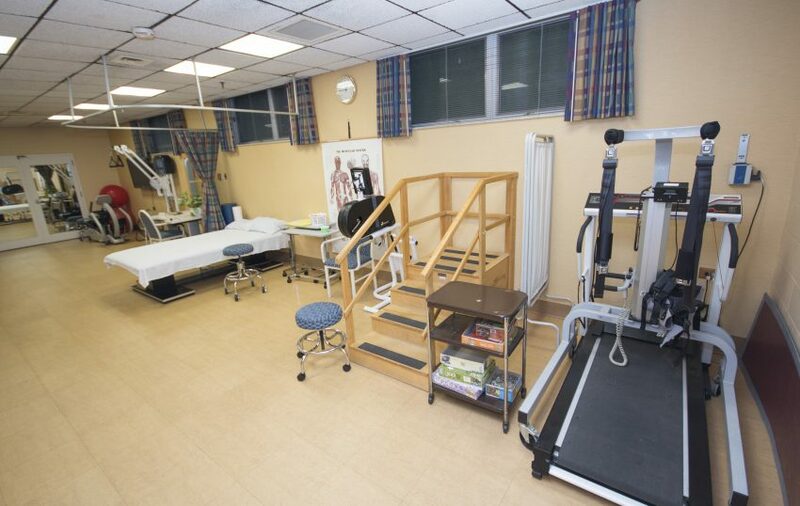 If you or a loved one is preparing for a surgery, stop by Elmhurst Extended Care Center today to see how our dedicated team of rehabilitation therapists can assist you with your recovery.